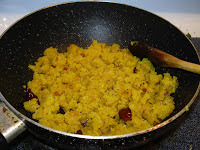 Your recipe looks nice, and is definitely new to me...though looks very similar to Poha! Nice dish. i make the same type but with buttermilk instead of tamarind! will try this. Yep nidhi, its very easy and quick to make. Spicy lovers will like this. Thanks dershana for the visit. will check your blog too. Hey vidhya..very nice puli upma...i totally forgot about it....should make it soon..can't wait..
BTW thanks for linking my page from yours..i will link yours from mine soon too.. I tried this yesterday and it came out great !